Acer's extra-wide LCD monitor for business users offers crisp picture quality for office apps, vibrant output for photos and video playback, and it comes with a stand that allows it to move up, down, side to side, and pivot. Well worth a look if you're after a new screen. Acer's 29in ultra-widescreen monitor is part of a new breed of monitors that's slightly different from the norm. Rather than offering a traditional 16:9 aspect ratio, the Acer B296CL offers a wider 21:9 ratio, which not only suits most movies a lot better, it's also more conducive to multitasking. A native resolution of 2560x1080 is provided by Acer's B296CL, and this is 640 pixels wider than a Full HD (1920x1080) monitor. The extra pixels allow you to see more on the screen at any one time, and this is a great benefit when using applications that need to show lots of information in their window, be it tool palettes or timelines. It also comes in handy when multitasking, because you can line up three almost-A4-sized windows side by side on the screen simultaneously. Widescreen movies (the ones shot in the anamorphic format) will be displayed more naturally on this screen than on a traditional Full HD monitor, with little to no black bars visible above and below the picture. That said, this monitor has the styling of a monitor that means business, rather than one that can be used for entertainment purposes in the home, and Acer is pitching the product to professionals. For perfect viewing in an office environment, the screen has a matte finish, and there is only a tiny bezel framing it, so there is no chance of reflections either off the screen or off the frame. To keep things neat, there is a built-in power supply, rather than an external power brick, so all you have to do to give it power is plug in the cable from the wall outlet. There are two HDMI ports, two DisplayPorts (one for input and one for output, so you can connect to a second display from the first display in a daisy-chain), as well as a DVI port, and a USB 3.0 hub with two ports. 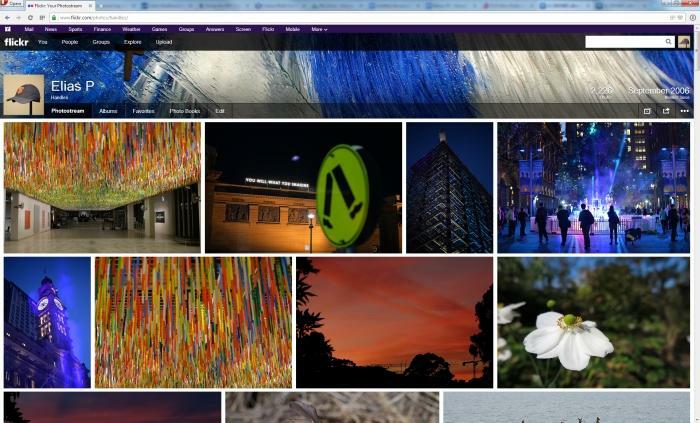 A typical Flickr page on a Full HD screen. The ultra-wide 2560x1080 screen shows a few more pics on the screen. The two USB 3.0 ports are located underneath the left side of the monitor, so it can be a little tricky to plug in temporary devices, and we would have preferred they be on the side, or even dropped down to face forwards. You also get a built-in speaker that should not be relied upon for any sort of serious listening. It’s basically there for convenience in case you absolutely have to listen to something and don’t have headphones or external speakers plugged in to your computer. What we love about Acer's monitor is that it ships with a stand that not only allows for swivelling and height adjustment, but also for pivoting. This means that you can view content in a very tall portrait mode. This is an advantage if you have a lot of information that you want to see on the screen vertically, such as programming code or other masses of text. For the most part, though, it feels off-putting to have a monitor in this orientation, and it can lead to a neck cramp depending on how you sit. It could be used for other things, though, such as a display to show multiple views from a surveillance system. 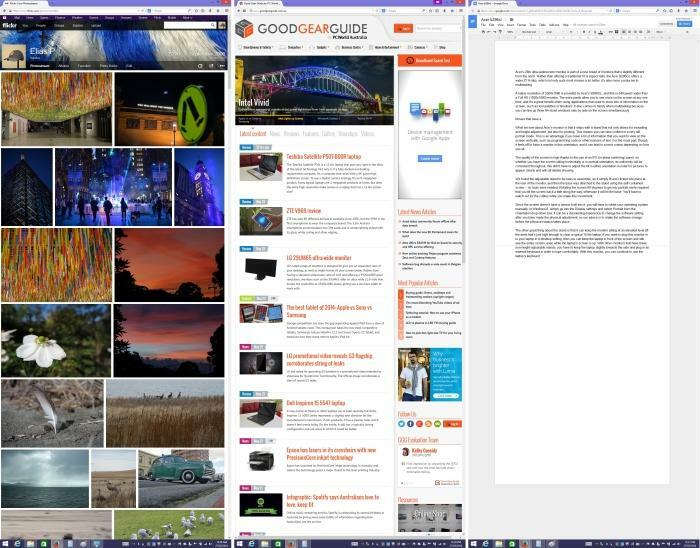 Here's what Web pages (the first and second screens in the shot) and docs (the third screen in the shot) look like when the monitor is in 1080x2560, portrait mode. We found the height-adjustable stand to be easy to assemble, as it simply fit and clicked into place at the rear of the monitor, and then the base was attached to the stand using the self-contained screw — no tools were needed. Rotating the screen 90 degrees to get into portrait mode requires that you tilt the screen back a little along the way, otherwise it will hit the base. You'll have to watch out for the cables while you make this movement. Since the screen doesn't have a sensor built into it, you will have to rotate your operating system manually. 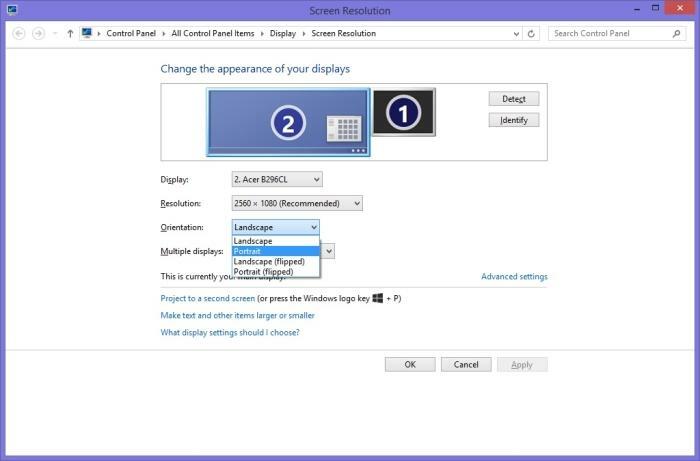 In Windows 8, simply go into the Display settings and select 'Portrait' from the Orientation drop-down box. It can be a disorienting experience to change the software setting after you have made the physical adjustment, so our advice is to make the software change before the physical rotation takes place. You have to manually change the orientation in Windows if you pivot the screen. The other great thing about the stand is that it can keep the monitor sitting at an elevated level off the desk that's just high enough to clear a typical 15.6in laptop. If you want to plug this monitor in to your laptop in a desktop setting, then you can keep the laptop in front of the screen and still see the entire screen, even while the laptop's screen is up. With other monitors that have lower, non-height-adjustable stands (such as LG's 29UM65), you have to keep the laptop slightly towards the side and plug in an external keyboard in order to type comfortably. With this monitor, you can continue to use the laptop's keyboard. The quality of the screen is high thanks to the use of an IPS (in-plane switching) panel, so whether you have the screen sitting horizontally or in portrait orientation, its uniformity will be consistent throughout. We didn't have to adjust the tilt in either orientation in order for pictures to appear clearly and with all details showing. Colour reproduction was vivid, black was deep, the screen was very bright overall, and the contrast in images and movies ensured that all necessary details were present. An easy on-screen menu can be accessed from the buttons at the front of the screen, and these have all the usual picture quality settings, preset screen modes, as well as an ‘eco’ mode that dims the brightness level for you so you don’t have to go fiddling in the picture settings. You also get options for picture-in-picture, and split-screen modes, though the split-screen mode skewed the picture and made it unusable for us. Its picture quality, coupled with the versatile stand and connectivity options make the B296CL a worthy option for office use, and especially for those of you who want to add a wider view to your desktop and improve your multitasking and general office application usage.